Canadian Xpress Tanlin is the organic approach to eliminating Scarid fly and fungus gnat. It is absolutely safe, efficient and free of all odours. A common name for Canadian Xpress Tanlin is also Nilnat. Tanlin consists of chitin and has no harmful effect on the beneficial microorganisms residing in plants. Canadian Xpress Tanlin is safe to utilize with a variety of grow-systems and of course, within any medium. The process is simple. For recirculating hydroponic systems mix Tanlin into the reservoir at a proportion of 1ml, approximately 40 drops per 100 Litres. Mix thoroughly. For use with coco or soil, add a single drop of Tanlin to water (2 Litres) and meticulously saturate the growing medium. Repeat this step ach week. Apply Canadian Xpress Tanlin when necessary or introduce it as part the routine feeding process. When the root system of your plant is damaged, the crop is also. The maggots mature in about two weeks and proceed to produce their individual batch of eggs. Each female produces approximately 200 eggs. That equates to more than 15,000 maggots eating and destroying roots within a period of four weeks. You should begin the treatment before the development of adult flies. Follow the instructions as they appear on the label. It is most beneficial when preventative measures are taken. In all types of areas and in all types of growth processes, one of the biggest threats is the Scarid Fly. It poses a major threat to the sustainability of the hydroponic growth process in all areas of the world. For a long time, the only approach was poisonous substances which are eagerly consumed by plants. This presents a major threat to the health of humans and is extremely harmful to the plants. It poses a threat to the roots. Toxic chemicals are not to be used as a preventive measure but as a cure once the crops are attacked. Don’t take unnecessary risks with your plants or crops. 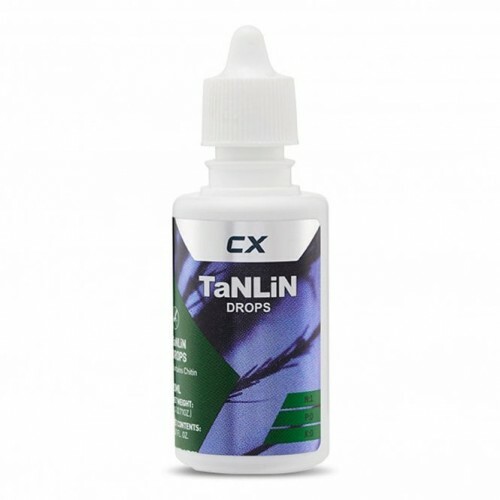 Utilize Canadian Xpress Tanlin during the growth cycle to prevent damage and protect your crop. Fungus Gnats, sometimes referred to as Scarid Fly pose a major threat to plants that are grown indoors. These gnats are the equivalent to spider mites but can be much worse. This is because the damage they cause is deeply hidden within the roots, which makes it less visible to growers. Your crop could be damaged long before you realize it. The maggots that are produced from the eggs laid by Fungus Gnats eat the root of the plant. Although small, they are excessive eaters and gnaw through the system faster than new roots can be produced. This tarnishes the plants ability to ingest water and necessary nutrients. This damage leads to the exposure of infectious disease in the root. This means that the root system can undergo extreme damage without your knowledge. Though common, fungus gnats may not be easily identified. The mature ones (adults) are subtle, dark grey in colour and resemble mosquitoes but with lengthier legs and translucent wings. They have a weak flight and typically arise from plants mostly during watering. The head of the maggots are shiny and black and the body is long and white in colour. The maggots appear in primarily damp environments with rich dirt. They nest on the hairs of the root and other materials that are organic. Please note that larvae pose the biggest threat to cuttings, young plants, and seedlings. There are several benefits to consider with Canadian Xpress Tanlin. Growers often seek solutions that are environmental-friendly and non-harmful to the plants. The ingredients interact with plants and it is created especially for edible crops. Plants, pets, and people are completely safe with the use of Tanlin. Canadian Xpress Tanlin is a high-quality product that effectively eliminates the presence and reduces the probability of harmful pests in plants. Your crops are precious and deserve to be treated with care. Only utilize non-toxic products to treat them. This increases their chance to grow into strong and healthy crops. Take the safe but effective approach to treat your plants and crops. Canadian Xpress Tanlin is used for personal and commercial projects. Growers around the world have found it to be one of the most beneficial treatments available. Fortefog P Fumer Smoke BombPesticide Smoke Bomb Generators. Fortefog fumers are the ready to use str..
Growstone Fungus Gnat NixFungus Gnat Nix The Only Fungus Gnat Control With No Harmful Pesticides Or ..
Hy-Catch Yellow Sticky Fly TrapsThe Yellow sticky traps are your alarm system that detects harmful i..
Canadian Xpress TANLIN (NILNAT)Canadian Xpress Tanlin is the organic approach to eliminating Scarid ..